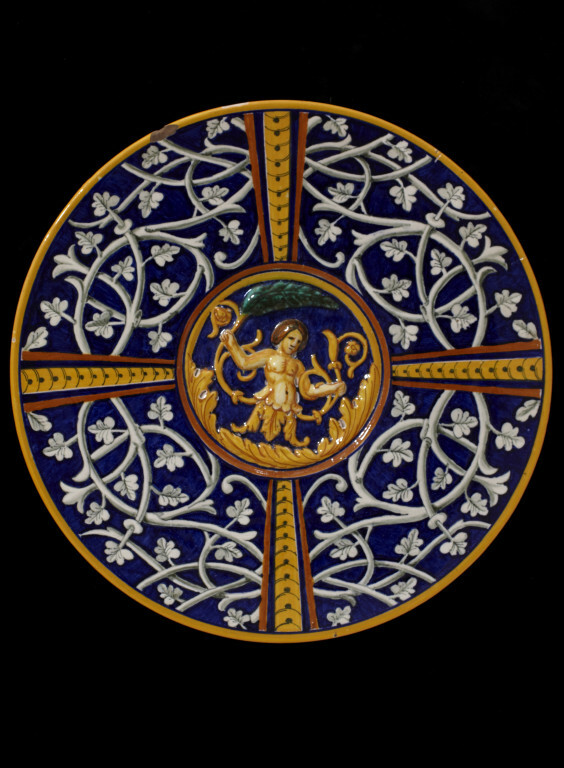 The Ginori company, founded in 1735 in Doccia near Florence, built its reputation on imitations of Italian lustred wares and maiolica of around 1500. Under the Marchese Lorenzo Ginori Lisci (d.1878), director from 1848, the pottery produced designs reflecting more varied and more contemporary tastes but also continued making its successful lustred wares. In 1896 the pottery came under the ownership of Giulio Richard who already owned other factories. Combined, the new company was known as the Società Ceramica Richard-Ginori. This plate was displayed at the International Exhibition, 1862, London and subsequently given by Ginori to the South Kensington Museum (V&A). It is modelled from an original Renaissance example illustrated in Art pour tous, n. 44, 10 juillet 1862, p. 175 as being in the Musée de Cluny (today the plate is in the Musée National de la Renaissance - Château d'Ecouen, Inv No. ECl.2621) and later illustrated in A. Darcel and H. Delange's 'Maioliche Italiane del XV e XVI secolo', 1869. plate XCIII. The Ginori example is so close to the original, that it is most likely the factory had access to the Renaissance plate. The plates are almost the same size (27.7 cm original and 27.9 cm Ginori) and the decoration on the reverse of the Renaissance example, two concentric bands of petals in blue, is not known to have been published in the 19th century, here replicated on the Ginori plate. The main differences between the two being that the mark on this example is 'G encircling F' and on the original 'B', here also the decoration of grotesques is repeated in the same form in each quarter of the plate whilst on the original each quarter is different. This slight variation was evident in other designs by Ginori such as oval dish, mod.7, dec.126 shown in the design album of ca.1875 (derived from plate XCIII in Darcel, Delange 1869) where again in the Ginori version the grotesque decoration is repeated in each reserve but different for each in the original. This may have been to 'improve' the design or simply to reduce the technical difficulties of making these intricately decorated pieces. The Ginori plate, model number 15, was available with the grotesque designs depicted on this example or with stylilised leaf motif border decoration. Both options were illustrated in a catalogue of the factory's wares 'Prodotti Artistici Ginori Doccia, Societa Ceramica Richard-Ginori' published ca.1905 which demonstrates the continuing popularity of the revivalist styles into the 20th century. Plate of tin-glazed earthenware, in imitation of Maiolica. Dark blue ground, with orange and white arabesque pattern, a figure in relief in the centre. Balleri, Rita & Rucellai, Oliva, 'Ginori maiolica in the second half of the 19th century: main historical events and artists' in 'The Revival of Italian Maiolica: Ginori and Cantagalli' Edizioni Polistampa, Florence, 2011. pp.84-85. 'Prodotti Artistici Ginori Doccia, Societa Ceramica Richard-Ginori' Florence, published ca.1905. TAV XIV (same model number 15 and same central decoration, with stylilised leaf motif border decoration), TAV XXII (same model and decoration as 8081-1862). 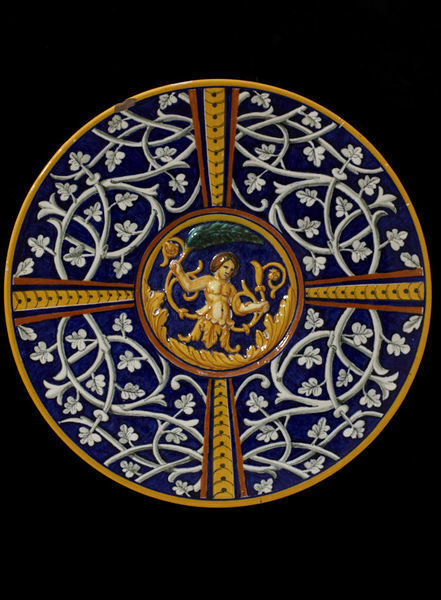 Original maiolica plate now in the Musée National de la Renaissance - Château d'Ecouen (ECI.2621). Darcel,A., Delange, H., 'Maioliche Italiane del XV e XVI secolo', 1869. plate XCIII. 'Societa Ceramica Richard-Ginori. Stabilimento di Doccia. Album delle maioliche artistiche', ms., ca. 1875, (Archivio del Museo di Doccia). The plate with a dark blue ground, with orange and white arabesque pattern, has a mould-pressed figure in relief in the centre. Ginori displayed this plate at the London International Exhibition 1862 and subsequently gave it to the South Kensington Museum (V&A) the same year. 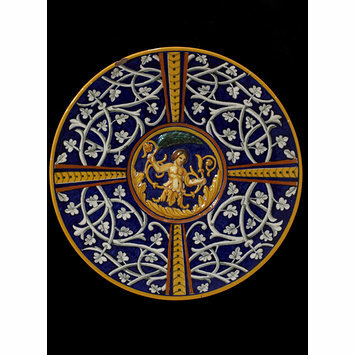 It is modelled after a Deruta plate, 1500-1530 (illustrated in L’ART POUR TOUS 1862, p. 175, as then on show in the Musée de Cluny).This dish from the Delange Collection is in the Musée National de la Renaissance Château d’Ecouen (inv. ECl.2621; I wish to thank Thierry Crépin-Leblond, Françoise Barbe, Christine Descatoire and Christine Duvauchelle for this information). The Ginori example is so close to the original, that it is possible the factory had access to the Renaissance plate. The plates are almost the same size (27,7 cm original and 27,9 cm Ginori) and the decoration on the reverse of the Ecouen example, two concentric bands of petals in blue, which is not known to have been published in the 19th century, here replicated on the Ginori plate. The main differences between the two are that the mark on this example is “G” encircling “F” (Ginori Factory or Florence) an adaptation from the mark “B” on the original, here also the decoration of grotesques is repeated in the same form in each quarter of the plate whilst on the original each quarter is different. This slight variation was evident in other designs by Ginori such as oval dish, model “7”, decoration “126” shown in the design Album about 1875 (AMD, inv. 428, derived from plate 93 in DARCEL, DELANGE 1869) where again in the Ginori version the grotesque decoration is repeated in each reserve but different for each in the original (BALLERI, RUCELLAI 2011, p. 84-85 note 48).This adaptation may have been to ‘improve’ the design or simply to reduce the technical difficulties of making these intricately decorated pieces. The Ginori plate, model number “15”, was illustrated in the factory Album 1873 and available with the grotesque designs depicted on this example or stylised leaf motifs. Both options were illustrated in a catalogue Prodotti of the factory’s wares published as late as about 1905 which demonstrates the continuing popularity of the revivalist styles into the 20th century. Factory model number 15 'Societa Ceramica Richard-Ginori. Stabilimento di Doccia. Album delle maioliche artistiche', ms., ca. 1875, (Archivio del Museo di Doccia).